Mountain House Holidays are pleased to announce this years summer programme of guided walks in The Peak District. All of this years guided walks are priced at £20 per person and the one visiting the famous Rockhall Cottage built into the Roaches includes a bacon sandwich and hot drinks! In addition, Mountain House Holiday run Navigation Courses and Mountain Skills courses through their training company, Peak Navigation Courses. Mountain House Holidays is run by Jane Livingstone and Michael Hunt, both qualified International Mountain Leaders. Scrambling in the Peak District! Yes it's official! With the Publication by Cicerone of a new guide to scrambles in the Peak there is sure to be a surge of interest in scrambling. We at Mountain House have been leading people up various scrambles over the years as part of our navigation courses and guided walks. Scrambling is great fun and occupies that area between hill walking and rock climbing. At its easiest (grade 1 scrambles) it requires the occasional use of hands to move between boulders or up rock slabs, whilst at its hardest (grade 3 scrambles) are easy rock climbs. The scrambles that we are offering to lead and supervise are all either grade 1 or grade 2 scrambles that do not routinely require the use of a safety rope. That said, our qualified leaders will carry safety equipment in case anyone has trouble or finds themselves lacking in confidence. These are all day itineraries starting at 10am and aiming to finish around 4.30pm. Please come equipped wearing walking boots and with waterproofs, warm clothes, packed lunch and enough to drink. Should the weather not be suitable for safe scrambling then we will offer an alternative itinerary on the day. All of these days will involve some hill walking getting to and between scrambles, all of which will involve some steep slopes and possibly boggy ground. We are now six days into this years Peak District Walking Festival. Mountain House Holidays are providing 15 walks in 18 days. So far there has been wind, rain, sleet, hail and snow on 5 of the six days! This is in great contrast to last years walking festival when we had warm sunshine every day. Despite the weather we have managed to follow our programme each day though hopefully we will see an improvement in the next few days. 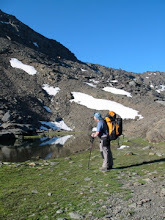 In addition to supporting the walking festival, Mountain House run a programme of guided walks; navigation courses and hill skills courses; and walking holidays in Spain's Sierra Nevada Mountains. Mike and Jane who run Mountain House are qualified International Mountain Leaders and rock climbing instructors.